Perched on the foothills near Camos do Jordão in Sao Palo, Brazil, the House For A Couple is a thoughtful residence made from low-impact materials that minimizes any disturbance of its site. The architect André Eisenlohr built the home as a bridge projecting out to the forest below it. 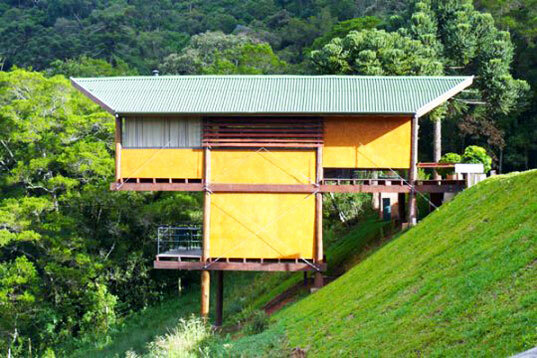 The lightweight wall system and carefully-balanced floors allow the structure to push further out than would be possible using traditional building techniques, thus reducing the overall footprint of the home dramatically. The home is an elegant site-appropriate design that was built after a thoughtful lifecycle analysis. 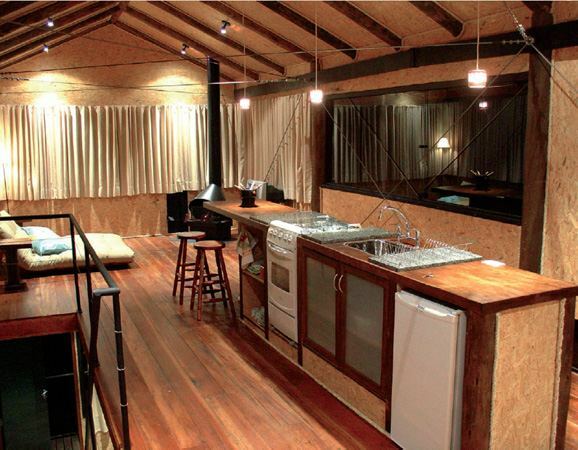 The walls are simple sheets of stock-sized OSB or chip board secured together with 5 cm stock in between. This improves the sheer of the walls and creates a channel to run wires and plumbing in. 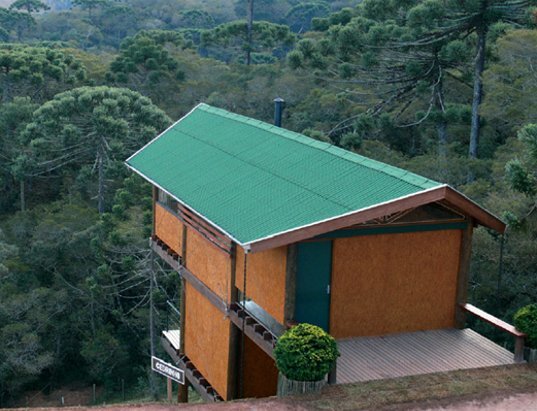 OSB is made from scrap wood materials, and it provides the finish for both the exterior and interior, simplifying the building process and reducing the overall cost of the home. The panels can actually unscrew to allow access if needed. When the home is decommissioned the dimensional panels can simply be deconstructed and used again. The 62 square-meter home has a simple layout consisting of a great room at top and a small lower bedroom with a walk-out porch. Sustainably-forested Muiracatiara eucalyptus posts and beams frame the structure, and exterior wires help support the cantilevered main floor but are flexible during windy conditions.